10 – Green Bay Packers – The Packers hammered the Broncos 49-23 to move to 4-0. 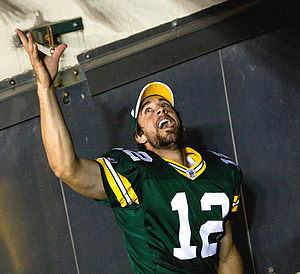 When Aaron Rodgers is on his game, no team in the NFL can compete with the Packers. The champs are off to a great start in their title defense, and are in great form entering a Sunday-night showdown in Atlanta. 9 – Baltimore Ravens, New England Patriots – The Ravens won a weird game against the Jets thanks to three defensive touchdowns. While Joe Flacco’s performance has been up and down, the Ravens are still a solid 3-1. 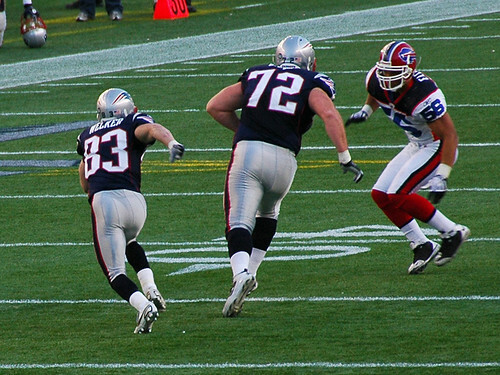 The Patriots rebounded from a loss in Buffalo by beating the Raiders 31-19 on the road. Now the Pats face the reeling Jets in Foxboro with a chance to grab control of the AFC East. 8 – Detroit Lions (UP A LEVEL), Houston Texans, New Orleans Saints, San Diego Chargers, Tampa Bay Buccaneers – We covered the pride of the Lions in Rise/Sink/Float. The Texans got a statement win at home against the Steelers, and their defense bounced back after a debacle against the Saints in Week 3. Houston now hosts the Raiders with a chance to start the second quarter of the season strong. The Saints got a solid if unspectacular win in Jacksonville to move to 3-1 as well. They’re playing better than any other NFC South team, but a trip to Carolina next week is no gimme. The Chargers have avoided their typical September struggles and have moved to 3-1. They go to Denver this week with a chance to open an even bigger division lead. We’ll have much more on the Bucs’ win over the Colts in a post later today. 7 – Atlanta Falcons, New York Giants (UP A LEVEL), New York Jets, Philadelphia Eagles (DOWN A LEVEL), Pittsburgh Steelers (DOWN A LEVEL) – This is the group of 2011 playoff teams that are on the verge of falling out of contention. We covered the Eagles’ descent in Rise/Sink/Float. The Falcons won in Seattle, but nearly blew a big lead. Still, getting a road win in the tough environs of Seattle is a credit. The Jets looked awful against the Ravens, and their offense is really struggling without C Nick Mangold. But the Jets often start slow and still bounce back. The Steelers lost in Houston, and given the injuries on the offensive line and signs of age on the defensive line, it’s hard to see them as elite anymore. The Super Bowl loser’s hangover is definitely in effect in Pittsburgh. The Giants move up to this level, because while we’re not sold on them, they’re playing fairly well so far. They found a way to win in Arizona and now return home to face Seattle with a chance to move to 4-1. 6 – Buffalo Bills, Chicago Bears, Dallas Cowboys, Oakland Raiders, Washington Redskins – We covered the Bears in depth in this game post, and we focused in on the Redskins in Rise/Sink/Float. The Bills lost a lead in Cincinnati, which isn’t shocking. Buffalo’s offense is good, but the defense needs work and will likely be what keeps them out of the playoffs. The Cowboys lost a huge lead at home against Detroit, and while the Lions are good, that’s a blow. Despite talent, the Cowboys are likely outside of the playoffs. The Raiders lost at home against the Patriots, and at 2-2 they’re at a crossroads. Their trip to Houston this week will be fascinating to watch. 5 – San Francisco 49ers (UP A LEVEL), Tennessee Titans (UP A LEVEL) – We aren’t really believers in either the 49ers or the Titans to make a serious run at contention, but both teams move to 3-1. The 49ers won in Philadelphia, and in a weak NFC West, they’re in a fine position so far. Now the Golddiggers return home to host the Buccaneers, who travel across the continent on a short week. The Titans thrived despite Kenny Britt’s absence, throttling the Browns 31-13 in Cleveland. They have an opportunity to capitalize vs. a struggling Steelers team this week. 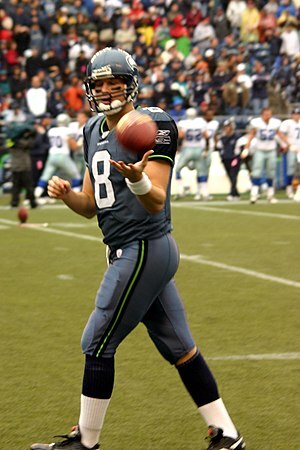 Matt Hasselbeck has to be among the league MVP candidates through the first quarter of the season. 4 – Arizona Cardinals, Cleveland Browns (DOWN A LEVEL), Jacksonville Jaguars – The Browns got blasted at home against the Titans, so they fall a level to join other game teams who don’t win often in the Cardinals and the Jaguars. Jacksonville played decent defense but lost at home to New Orleans, while the Cardinals couldn’t hold a lead at home against the Giants. 3 – Carolina Panthers, Cincinnati Bengals, Denver Broncos, Indianapolis Colts, Kansas City Chiefs, Seattle Seahawks (UP A LEVEL) – We covered the Panthers’ loss to Chicago in this game post. The Bengals won at home against the Bills, while the Chiefs got their first win at home against the Vikings. The Broncos predictably got blasted in Green Bay. Seattle moves up a level because their offense showed some life in a near-comeback against Atlanta. We’ll have much more on the Colts in a post later today. 2 – Miami Dolphins (DOWN A LEVEL) – The Dolphins were game in San Diego against the Chargers, but they ultimately fell 26-16. They enter their bye with vultures circling over head coach Tony Sparano’s head. 1 – Minnesota Vikings, St. Louis Rams (DOWN TWO LEVELS) – The Rams continued to be as listless as any team in the NFL in their 17-10 loss to the Redskins, so we have no choice but to put them at the bottom level. They’re joined by the Vikings, who fell to 0-4 as well in a road loss to the previously punchless Chiefs. For National Football Authority, we get an up-close-and-personal look at the Jacksonville Jaguars, one of our sleeper teams of the year, as they beat the Tennessee Titans 16-14. Click here to read about the debuts of Matt Hasselbeck and Luke McCown, the Maurice Jones-Drew controversy, the Jaguars’ strong defensive performance, and how Kenny Britt nearly won the game for Tennessee by himself. Ray Edwards, the Vikings’ up-and-coming defensive end, earns the spotlight in the third installment of our Finding a Fit series that will continue as long as the lockout drags on. In this series, we’re going to look at free agents and try to match them to their perfect fits. We’ll consider opportunity, skill specificity, personality, and even money as we do this. We’ve already addressed QB Matt Hasselbeck and CB Nnamdi Asomugha in this series. With each entry, we give a quick synoposis of who the player is at this point, and then seek to find a fit. Playing across from Jared Allen, Edwards has developed into a reliable pass rusher with at least 8 sacks in each of the past two seasons. Now he’s ready to cash in and become a team’s focal pressure point, out of Allen’s shadow. The stats indicate that Edwards is ready to take that step after five NFL seasons, but he didn’t get the chance to hit the market last year because the uncapped year meant that unrestricted free agency wasn’t possible until players had accrued six seasons, instead of the previous four. Edwards would get stuck in limbo again if the NFL carried over 2010 rules to 2011, but a new labor deal (whenever it happens) should allow Edwards to hit the open market. In the absence of a Julius Peppers-level superstar, Edwards should be the top 4-3 defensive end on the market. That’s necessary, because his first pro boxing match, while a win, showed that hitting the ring isn’t a long-term career option. Minnesota – Edwards was unhappy when the system locked him into the Vikings last year, because it cost him millions of dollars in guarantees. The Vikings will keep Edwards for one more year if the system makes it easy again; otherwise, given the investments in Allen and LB Chad Greenway, the Vikings will probably let Edwards price himself out of town. Edwards seems to have the itch to prove himself as a No. 1 pass rusher. That’s not always wise, but once a player gets that inclination, it’s hard to be happy returning to the same place. Atlanta – The Falcons have gotten as much as possible out of injury-prone John Abraham the last few years, but they could use another pass-rush threat. Edwards fits from a scheme perspective, and he would be the kind of player a contender can justify overpaying in an attempt to get over the hump. The question is whether the budget – and whatever the new salary-cap rules are – will allow the Falcons to make a big run at Edwards. Tampa Bay – Had free agency happened before the draft, the Buccaneers could have been major players for Edwards. But after drafting DEs Adrian Clayborn and DaQuan Bowers, it’s unlikely the Bucs would invest in Edwards too. That’s too bad for Edwards, because it would have been a perfect fit scheme-wise on an up-and-coming squad. Denver – The Broncos haven’t been linked all that often to Edwards, but as John Fox moves the team to a 4-3 defense, it needs a premium defensive end. (Rookie Von Miller is a pass rusher, but he is so small that he’ll probably need to do so from a linebacker position.) So Edwards could be an impactful veteran addition. The question is whether Denver will pay a premium price for a player like Edwards, or whether the Broncos will instead try to add multiple players at cheaper prices. We expect the latter, which would rule Edwards out of the Mile High equation. Buffalo – Like the Broncos, the Bills are moving to a 4-3, which makes Edwards a good fit. But Buffalo isn’t traditionally a prime free-agent destination, and they aren’t usually the highest bidder either. And Edwards is unlikely to sign up for this big of a rebuilding project. So this marriage looks unlikely, even if it is a fit from a scheme perspective. Carolina – The Panthers need a 4-3 defensive end, especially if potential free agent Charles Johnson departs. Edwards would be a viable replacement for Johnson, but if the Panthers are going to spring for a high-dollar player, they’re far more likely to keep their own guy instead of bringing Edwards to town. 1. Atlanta – The need is there, and playing for a contender would certainly appeal to Edwards. This would be a win-now move for the Falcons, who showed with the Julio Jones trade in the draft that they’re willing to take this kind of big swing. 2. Denver – The system switch could entice the Broncos to overpay Edwards. That’s not the approach we would take, but Denver often opens up the purse strings in surprising ways. 3. Minnesota – Only a fit if the system allows them to underpay Edwards for the second year in a row. There’s not much real NFL news out there as the lockout continues, but that hasn’t stopped the rumors from floating around. 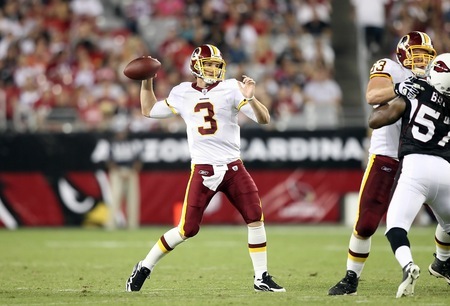 Kevin Kolb remains a hot prospect for several teams at quarterback, while rumors are that the Redskins are prepared to go with John Beck as their starting quarterback. Since both Kolb and Beck are former second-round picks, I was curious to dig back through drafts of past years to see how such picks have done in the NFL. The results of this research project were startling, and they revealed that both the second and the third rounds of the NFL draft have become the quarterback dead zone. Only 14 percent of quarterbacks (5-of-35) taken in the second and third rounds since 1997 have been successes – and that’s if you grade generously and count Kolb as a success. And if you start grading after the first third of the second round, the success rate plummets even more to 7 percent (2-of-29). Let’s look back at the drafts to see how these failures have happened. Our guess is that you’ll look at this list and marvel at just how poorly teams have done drafting quarterbacks in the dead zone. And after the list, we’ll make some conclusions. FYI, Quarterbacks who we’re grading as successes are in all caps below. We went back through the 1997 draft, since there’s only one QB left in the league who entered before then (Kerry Collins, 1995). History tells us that to have any chance of success with a second-round quarterback, you have to take him in the first 10 picks of the round. That’s what the Bengals did with Andy Dalton and the 49ers did with Colin Kaepernick this year. But after the first 10 picks of the round, the chances of success plummet and stay low through the third round. And we discussed last year how trading into the back end of the first round for a quarterback is a strategy that fails. In other words, it seems like the best chance for success with a quarterback isn’t just taking one early – it’s taking one in the first 15-to-20 picks. Spending a second- or third-round pick is an even worse risk than the 50/50 shot a first-round QB is. Meanwhile, lower-round quarterbacks – Kyle Orton, Matt Cassel, Ryan Fitzpatrick, David Garrard, Matt Hasselbeck, and of course Tom Brady – have had more success than the QBs taken in the dead zone of the second and third rounds. While it’s been a few years since a late-round or undrafted QB has rocketed to stardom, finding a QB that way is ironically a better bet than taking one in the second or third round. All this history points does not bode well for recent draftees like Jimmy Clausen (who appears headed down the traditional second-round path) and Colt McCoy (who has shown a bit more promise). And it makes us wonder whether the Patriots’ 2011 gamble on Ryan Mallett will end up like their selection of Kevin O’Connell three years before. We’ll see if Dalton, Kaepernick, Mallett, or any other young quarterbacks can escape the trend. But for now, we have no choice but to believe in the force of the QB dead zone.